The ToT was organized during an earlier trip to Pulan County to help improve communication and local service to visitors, and create increased awareness on waste and sanitation as well as cultural sites around the Mount Kailash Kora; to follow up on tourism activities post the Sino-Nepal tourism meeting; assess waste management and sanitation activities in Hor Township and follow up on a food and beverage training organized at an earlier date for participants in Pulan County. Dr Yonten Nyima and Renzin La from Sichuan University, and Dr Yan Zhaoli from CIB facilitated the training programme along with ICIMOD tourism specialist Marcello Notarianni and GIZ technical advisor Corinna Wallrapp. 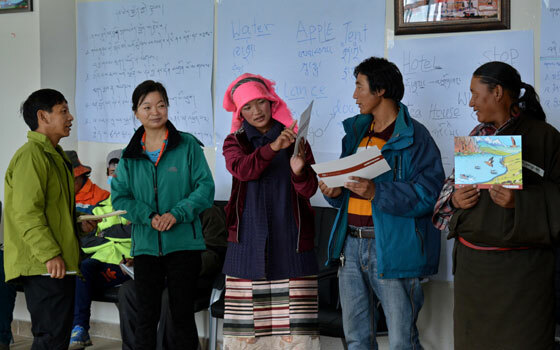 Thirty yak and horse herders, members of four sub-groups of the local transportation team, and one representative from the Gangsha village government participated in the ToT. The event emphasized using the KSLCDI communication booklet to improve communication with visitors, and increasing awareness regarding safety issues and cultural sites. It was decided that content from the communication booklet will be scaled up for billboards, and shared via social networks such as WeChat in an area where smartphone infiltration is at its maximum. The participants expressed concern regarding the construction of the Kora Road, which might pose a threat to cultural sites around the Kora. While discussing concerns related to heritage tourism, they talked about the possibility of tourists getting into horse- and yak- riding accidents, spoke about difficulties in communicating with international tourists, and about problems associated with tourists not sticking around tour guides. The proximity of the local garbage dump to Mount Kailash and the responsibility of travel companies in terms of improvising waste management around Drolma Pass were also discussed. Based on a participatory approach, the training triggered good discussion and raised awareness in an area were such events are rare. By the end of the three-day programme, the participants had made plans of their own for training local groups during the winter months on issues including safety, cultural sites, waste and sanitation. Additionally, the KSLCDI team’s conversation with participants of the food and beverage training conducted in the region in November 2015 to study improved hygiene, services, cooking skills, and business vision revealed that all participants had appreciated the training. Figures related to additional customers or increased income to evaluate impact, however, could not be collected. The Kailash team received requests for more training, specifically on Tibetan and Chinese cuisine, and tourism services to customers. Through conversations with Nepali traders from Humla and Darchula, the team also learned about an age-old transboundary fair that traditionally takes place in Gya Nyima, close to the Nepali and Indian border. A few things could be triggered as a result of the field trip, and follow-ups are necessary. A lot more needs to be done.